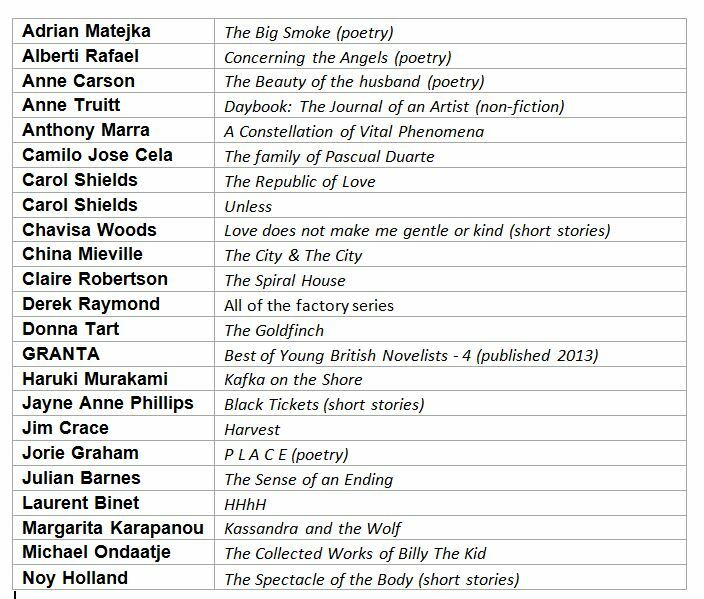 At the end of 2013 I wrote a short piece for my blog (Best Books of 2013) that listed my favourite books of the year. It was a satisfying thing to do, I felt I had acknowledged the books I had read and enjoyed. At the beginning of 2014 I vowed to write down all the books I would read in 2014 and provide another list of my favourite reads. I started well—writing down all my summer holiday reading from December 2013 and January 2014—but then I started my MA in Creative Writing at Rhodes…. and I was co-writing the self-help book Sugar Free with Karen Thomson…. So this list of my favourite books of 2014 once again doesn’t come from a comprehensive base but it does include my favourite books that I wrote down and also ones that I remember reading. It is in alphabetical order. It is also longer than 2013—this time I have included poetry, short stories and non-fiction. It is difficult to define the effect that this book had on me but it is best described by this review in the Washington Post: Her Brothers Keeper. ‘Lark and Termite is set during the 1950s in West Virginia and Korea. It is a story of the power of loss and love, the echoing ramifications of war, family secrets, dreams and ghosts, and the unseen, almost magical bonds that unite and sustain us. At its center, two children: Lark, on the verge of adulthood, and her brother, Termite, a child unable to walk and talk but filled with radiance. Around them, their mother, Lola, a haunting but absent presence; their aunt Nonie, a matronly, vibrant woman in her fifties, who raises them; and Termite’s father, Corporal Robert Leavitt, who finds himself caught up in the chaotic early months of the Korean War. This extract was taken from the authors website – more about the book and the author can be found on the author’s website: Jayne Anne Phillips.